I met my friend Roger Stille the dancer on an early August afternoon when Montreal had reached that peak summer moment of sultry-humid, close, airless stillness, when its streets are like fissures in a ripe persimmon about to burst. For a month, nothing seems to happen. People drink beer on their balconies. Some escape to their country houses. No one cares about money or language. The world, though not perfect, settles into a thoughtless dream. Roger and I sit in a café with ceiling fans, his burgundy scarf fluttering in the breeze, and he tells me this story. “When I was eighteen, I spent a summer studying Japanese dance theatre in Tokyo. It was the year of the Kobe earthquake that killed over 6,000 people in southern Japan. There were seven of us, all young Canadian students of ballet and modern dance, sponsored by a Japanese foundation, eager to absorb the secrets of Kabuki, Noh Mai, Bon Odori, Nihon Buyo, and Butoh. Roger sipped his tea, raising his arm to adjust his scarf with the studied carelessness of someone who had been dancing for 20 years. “The young star dancer of the company, a man in his mid-twenties, performed last, accompanied by a musician who played a biwa, a sort of Japanese lute. It was a brilliant performance, technically perfect, and passionate. He danced the story of a poet’s dream, a story with birds in it, and clouds and water. At the end of the dance, which depicted the death of the poet, everyone stood and cheered. The performers, the teachers, the other dancers and the students were all very pleased and proud in that low-key, self-effacing Japanese manner. Then the company Master addressed the group with some wonderful news. His teacher and mentor, the retired former Master of the company, who had been seated at the back of the studio, had consented to perform for us. We all clapped wildly and sat back down. “A man in his 80s took the stage. He looked like the white-bearded King Lear character in Kurosawa’s Ran, and wore a rough Japanese singlet over traditional peasant pants. He began to perform the identical piece the young star of the company had just finished minutes before: the story of a poet’s dream, with birds, clouds, and water. His movements were slower, more restrained, and sometimes his limbs trembled. Some of his movements were not as technically perfect as the much younger man’s, but they contained nuances—the throw of a hand, a cat-like raising of the shoulders—that mesmerized everyone in the studio. 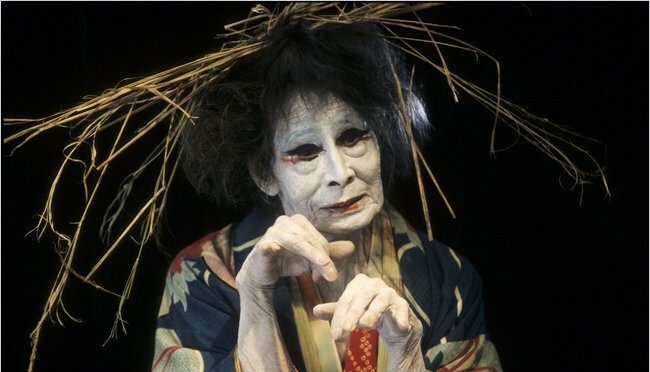 As the biwa strained at three or four final plucked notes, the octogenarian dancer arrived at the end of the story, the death of the poet’s dream. His dying body settled into the water and drifted up to the clouds. He stared at us fiercely, and then he closed his eyes. The performance was over. I felt like I could see them dancing in my mind's eye. Great piece. Rich, fluid, vivid writing: an emotional, and memorable, piece.